Polvorones in Spanish from polvo which means powder or dust, basically because when you eat them they will crumble to a dust like consistency. Polvorones traditionally from middle east, made their way to Andalucia, Spain and later to Mexico in which they are a traditional cookie for weddings and in the Christmas season. Traditionally, polvorones, are made of lurd. I couldn’t find it in the Miami area and been making them with regular, unsalted butter. Also, for more flavor I use pecans which can be replaced with almonds or not used at all and replace them with equal amount of flour. Long before I baked for a living I was making this ricotta squares. It all started because we love ricotta raviolis. There were times where we had way too much ricotta left. I love spreading ricotta on my toast, my mom would talk about this cheesecake she would make in Argentina that is NOT like the American cheesecake. And so, we embarked in the search for the Argentinean cheesecake and half way into it we discovered the ricotta square. I have adapted the original recipe to be kosher for passover or gluten free. If you do not like almonds, use pecans, cashews, or any sort of nuts. You could replace lemon for orange, although the hint of lemon makes a perfect combination with ricotta, making this squares perfect for breakfast, dessert, or to be served with coffee. Base:Preheat the oven to 350F. Butter the pan and the sides as well. Using a food processor combined the almond flour, sugar, butter, and egg yolks. Press into the bottom of cake pan. Cook for 10-15 minutes. It should be a bit golden, but not cook all the way. Remove and cool down while you prepare filling. Filling:Place the ricotta cheese on the bowl of a food processor. Pulse a few times. Add the heavy cream, vanilla extract, lemon zest, eggs, and sugar. Mix until well combines. Stop few times and with the help of a spatula clean the sides of the bowl. Pour on top of the base and cook for 40 minutes. Cool down until reach room temperature, refrigerate for at least 8 hours before unmolding. **Make Ahead: It is better to make at least one day in advanced. Can be store in the refrigerator for up to one week. I been so so so tired of the bought coconut macaroons served at every passover dinner. There is so much more beyond them. Besides, in my personal and modes opinion they are dry, and heavy! This recipe is parve (no dairy), gluten free, and you can add dry fruits if you would like to. You just need a bowl to mix all ingredients and a baking pan to cook it in the oven. It takes only 15 minutes to cook. This is a great recipe to ask your little ones to help you out. Preheat the oven to 350F. Line a baking pan with parchment paper. Whisk the egg whites and sugar until are completely combined and the mixture is frothy. Add the vanilla extract, orange zest, and salt. Add the coconut mix well. Using gloves and the help of a tablespoon scoop and shape them. Place them on the baking pan leaving some space in between. If you would like to cover them in chocolate wait until completely cool down, and then dip them in chocolate. **Make Ahead: Macaroons can be storage on an air tight container for up to ten days. With or without Ice cream, this pie is full of flavor and texture. The American classic receives a twist this week in honor of Pi(e) Day on March 14. I like Pie, not sure if a fan, but who says no to sweets, right? What I like about this recipe, is that the streusel on the top contributes by adding different texture to the whole. And even more, the streusel can be made with a whole bunch of different ingredients depending your taste, or why not what you have in your pantry. I have had streusel made of granola, just sugar and butter for more crunchiness, adding different nuts, and why not nut flour. All in all, I made this recipe in 3 hours, but active time was 45 mins. I think it is great that you can cook, go exercise, then do something else, do laundry, you know, you are cooking but also been active around the house. Feel free to experiment and let me know how it goes. Filling: Peel and cut the apples in cubes on no more than ½ inch. Add the sugar, butter, cinnamon stick, and apricot jam. Cook until apples are soft. Cool down. Streusel: Mix all ingredients in a bowl. Assemble: Place the filling on the cake, and then the struesel over it. Cook on 375F for 30-40 minutes, or until golden. **TIP: The dough can be held in the refrigerator for three days or frozen for up to three months. I grew up eating Panettone at home. Mom is a serious eater, she totally loves it. I learned to enjoyed it, then liking it, and now the number one fan. I have tried every single Panettone box out in the market. I have to confess that before becoming a serious baker it had never crossed my mind that I could bake it. In my first experience working at a bakery I certainly learned how to do it. The bakery was changing recipes at the time and it was very interesting to see how they were leaving one tradition after 10 years and starting a new one. Certainly the bakers were not happy with the change. I remember seeing the grumpy faces as they twiked it everyday, and my belly happy to try new flavors. 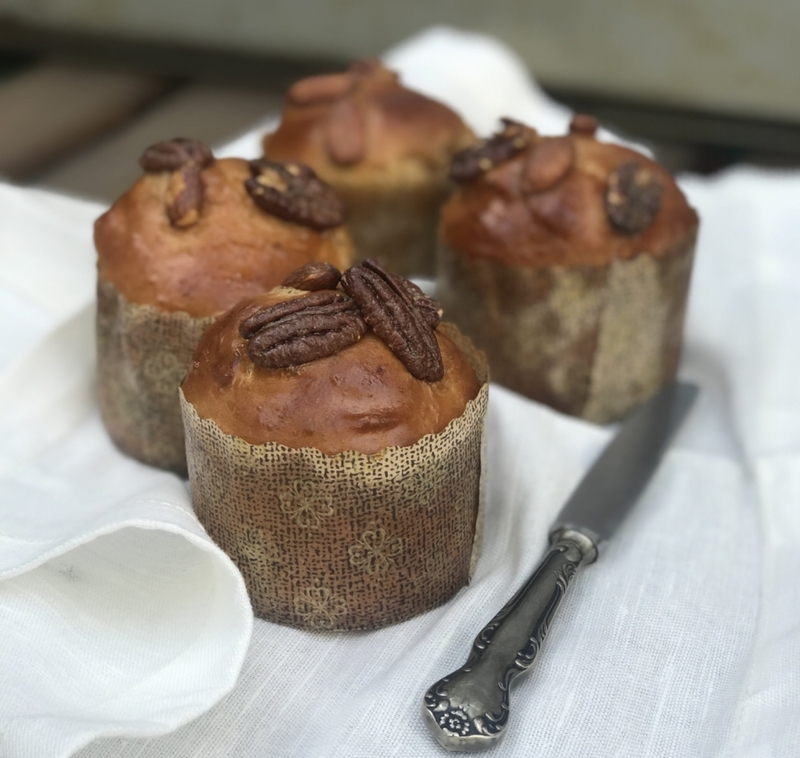 For mini Panettone, I make sure they are all 100 grams.This is a great gift for co-workers and friends. The process of changing, upgrading, or testing new recipes is a really interesting one. One, as the baker, needs to think of all the chemistry that might occur when you mix the ingredients together, make hypothesis about the outcome and certainly hope that it will be. In my case, it has never been a quick trip. It has always involved at least 3-5 tryouts. Which is not bad... but is not perfection. Yes, I know perfection does not exist, but I believe each and everyone of my recipes need to be perfect (at least under my eyes) before I get to share it. This panettone, had 6 tryouts. I think that not only the dried and candied fruits are very tasteful, but the dough by it self is absolutely delicious and one could make honey buns out of this dough... just giving some ideas out. Haven't try it, but if you do, please share the outcome. When you have shaped into a rectangle, roll from the furthest side, towards you. Hydrate raisins in desire liquid: cognac, rum, wine, water. Pre-fermented dough: In a small bowl combine the flour, milk and yeast. Mix, cover and let it rest for 20 minutes-1 hour. Dough In a small bowl activate the yeast by combining it with the milk, set aside. In the bowl of a stand mixer fitted with the hook attachment combine the pre-fermented dough, flour, sugar, vanilla extract, orange zest and juice, cognac, eggs, and milk. Mix until well combined, add the butter in pieces and keep mixing until dough comes out of the bowl. Cover and let rest until it doubles in volume. Preheat oven to 330F. Sprinkle all the dried fruit with flour (this is done for fruit not to add liquid into dough and not to sink to the bottom of the panettone). Stretch the dough in a rectangular shape, add the dry fruits, roll and cut into pieces. Scale to desire weight, place on liner, cover, and double in size. Egg wash with egg whites, and add pecans and almonds, or desire fruit to the top for decoration. Bake for 30-60 minutes, depending on panettone size. The holiday season does not begin until one bakes gingerbread cookies. The scent that gets spread around the house while the cookies are in the oven its wonderful. It is as clear as you if you would build the Christmas tree or put out the Chanukkiah. 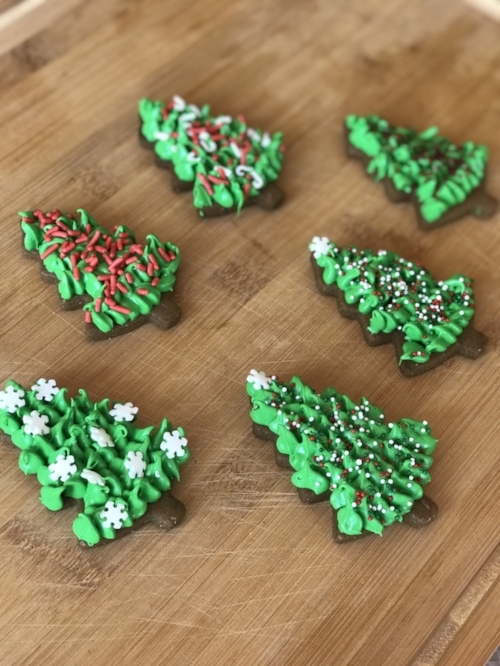 Gingerbread cookies is the synonym for Holiday season. Out of this recipe you can also make a gingerbread house, or an entire village. Get your family and friends around the table, cook together, build together and celebrate life. The baking is just another excuse. Dough: In a medium bowl combine the flour, baking soda and salt. 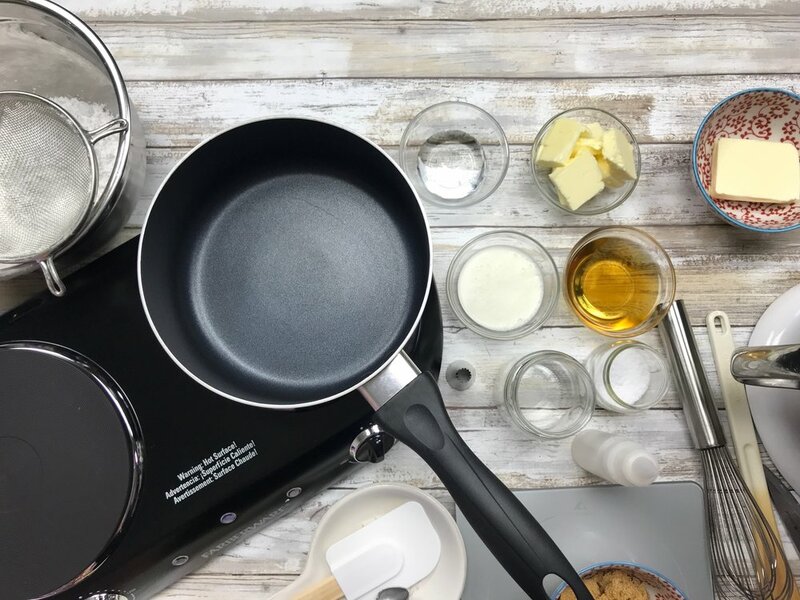 If using a stand mixer, use the paddle attachment and beat the butter, sugar and spices until creamy. Add the molasses and egg. Stop the mixer, scrape the bowl and add the flour. Mix until well integrated. Divided the dough in two pieces, roll the in parchment paper and place in the refrigerator for an hour. Preheat oven to 350F. Line a baking pan with parchment paper or silicone mat. Remove from the refrigerator and cut into desire shapes. Bake for 10 minutes. Icing: combine powder sugar and milk, little by little until desire consistency is reach. Place in piping bag or bottle and decorate. Back in February after a month I started dating Joaquin, he had asked me if for his friends birthday we could give them the birthday cake as a present. How could I say no? And so, we embarked in the journey of prepping birthday cakes at least 2 or 3 times a month. I started with the classic ones: key lime pie, brownies, chocolate, but needed to get a bit more creative. The birthday parties were coming more often than I could repeat the same cake. For Fran's birthday, I needed a day cake that it was both fresh, tasteful and grownup. Fran enjoys a good drink, paella was on the menu. I don't like whiskey but I do not dislike Bourbon. I took the bourbon path: and Bourbon Butterscotch Buttercream came up. It works awesome with chocolate or vainilla. You can always add a hint of bourbon to the cake batter for extra flavor. Vanilla cake with Bourbon Butterscotch Buttercream. It's a three layer 6-inch cake. Prepping Mise en Place is key to be able to prepare your recipe smooth and with no issues. Bourbon Butterscotch: In a small saucepan melt the butter over medium heat. . Stir in the sugar, corn syrup, and salt. Mixing continously with a plastic or wooden spoon until the sugar is completely melted. Remove the pan from the heat and while whisking pour the cream. Return the pan to the fire and stirring with the spoon for 5 minutes. Remove from the fire, stir the vanilla and bourbon. Pour into a heat safe container and let cool down, as it cool down it will thicken. Buttercream: Sift the powdered sugar on top of a piece of parchment paper. In the bowl of a stand mixer set with the paddle attachment place the butter. Cream the butter for a good 5- 7 minutes. The butter should be pale yellow, almost white. Stop the mixer, 2-3 times in between and scrape the sides and bottom of the bowl. Scrape the bowl one more time, and add half of the confectioners sugar to the butter. Start the mixer on slow. As you see small/ medium size crumbs start to form increase mixer speed. Stop the mixer at two different times, scrape the bowl and continue mixing and medium/ high speed. Before adding the powdered sugar scrape the bowl, and pour the sugar. Let it cream at medium/high speed for 4 minutes. Stop the mixer, scrape the bowl and add the Bourbon Butterscotch. Continue mixing until you reach a creamy and shiny buttercream. To decorate de cupcakes I drizzle the bourbon butterscotch on top of the buttercream. ** TIP: You can add as much Bourbon Butterscotch as you may like. Just be carefull not to make buttercream runny. You can scale the recipe up or down as you might like. To fill and decorate an 8-inch cake you will need to multiply the recipe by 8. To decorate cupcakes, I place them on a parchment paper and drizzle the bourbon butterscotch in diagonal lines. Every Friday night Jewish people around the world celebrate Shabbat: the day of rest. Growing up in a reform family, our Jewish celebrations were around the main and big holidays such as Rosh Hashanah (Jewish New Year) , Yom Kippur (the Day of Atonement), and Pesach (Passover). Celebrating or observing Shabbat was never a question neither a custom. I attended a Jewish Day school since I was two years old and the way until I moved here (for junior year). At school we did celebrated Shabbat every week. Not sure if it is the pictures I have seen (from my mom's bast collection of picture album from our childhood) or that I clearly remember, but at school we use to bake Challah every Friday! Week after week, we were there, pouring ingredients in a bowl, getting our hands dirty and figuring out all about the braiding. Later on, as I was working in a Jewish Day school in Miami, and later as a youth director I always thought cooking should be an essential part of our curriculum and was hoping to bring those memories for my students. 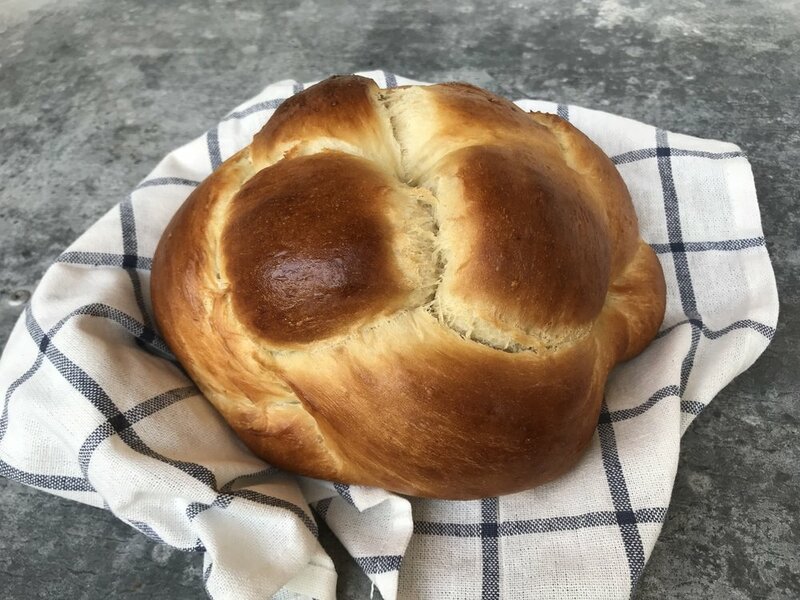 Last week, as I was teaching the Rosh Hashanah cooking class, one of the participants said: " Wow, Romi, that's a really good braiding, how many times have you done this?" and honestly it is way more than I could remember. For many years I jumped from one recipe to the other, taking what I liked from the previous and applying it to the new one. I finally have a good sweet recipe that I like. I use King Arthur all purpose flour because of the quality and gluten %. The oil, it is a non-flavored one: vegetable, canola, corn, or even grapeseed. I had used olive oil here and there when I want to make a rosemary or basil, or even onion and garlic challah. There is a two step in the Challah recipe. The actual Challah dough, and the preferment dough. The preferment dough is a mix of flour, water, yeast, and sugar. That is been done and let rest for 30 minutes . Here is where the yeast starts fermenting and the gluten web starts developing. An acidic smell will come along if you let it sit for an hour or even longer. This dough will help the challah rise and help with the flavor. I prepare the preferment dough and while I scale and prepare all the other ingredients it is usually ready. It will accelerate the process if you leave it on a warm place. I turn on the oven sometimes which will help make the environment warmer. Preferment Dough: Mix all ingredients in a small bowl cover with cloth and let it sit for 1 hour in a warm environment. Preheat the oven to 375F. Prepare a sheet pan by lining it with parchment paper or a silicone mat. In a small bowl mix the flour and salt. In a big bowl mix the water, preferment dough, yeast, egg, and honey (if using a mixer, use the dough hook and mix for 30 seconds). Add the flour and continue mixing for 5 minutes. Little by little add the oil and knead for 10-15 minutes. Cover and let it rest for 10 minutes. Flour the surface, divide dough into 100gr, should get 12 pieces of dough. Shape each piece into a loose ball by rolling it on a clean, dry work surface with a cupped hand, cover as you go. Using both hands roll them, with the “seam” facing down. Group them in 6 and braid the challah, cover the pan with a cloth and let it sit for 20-30 minutes. Brush with the egg mixture. Bake for 25-30 minutes. Enjoy and share with your family over Shabbat. **Optional: You could always add 1 ½ cup of golden raisins, chocolate chips, or sprinkles. Round loaves, where there is no beginning and no end, are baked for Rosh Hashanah to symbolize continuity.